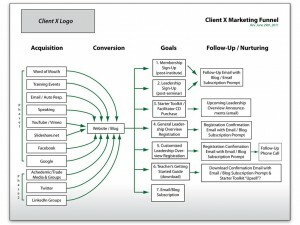 There is no shortage of articles on buyer profiling and personas on the CMI blog, but today I’d like to take that process one step further and show you how to improve the effectiveness and performance of your website by incorporating your buyers’ needs and wants into your website’s content architecture. Any good buyer profiling exercise should provide you with a list of each persona’s primary needs, wants, and pain points (you can download this buyer persona template from Barbra Gago). When thinking about website content, you want to figure out how your audience’s needs might translate into actual online research activities. You also want to determine both the online resources and keywords that might be used when doing this research, but when they land on your online doorstep, then what? What are the 2-3 things your personas are going to want to do/ learn/ find when they land on your site? What are the 2-3 things YOU want them to do/ learn/ find when they land on your site? The answers to these questions become the defined Key Visitor Tasks (KVTs) that now need to be mapped out within your website’s content and information architecture. With your KVTs defined, diagram the high-level flow of your overall online marketing efforts so that all parties involved — information architects, (IA), user experience professionals (UX), copywriters, search engine optimizers (SEO) — understand the primary goals of your website. Do this by creating a complete online marketing funnel diagram that displays each of the acquisition, conversion, and follow-up/ nurturing components of your marketing efforts. In this simple example, note how each conversion goal has been called out and numbered. 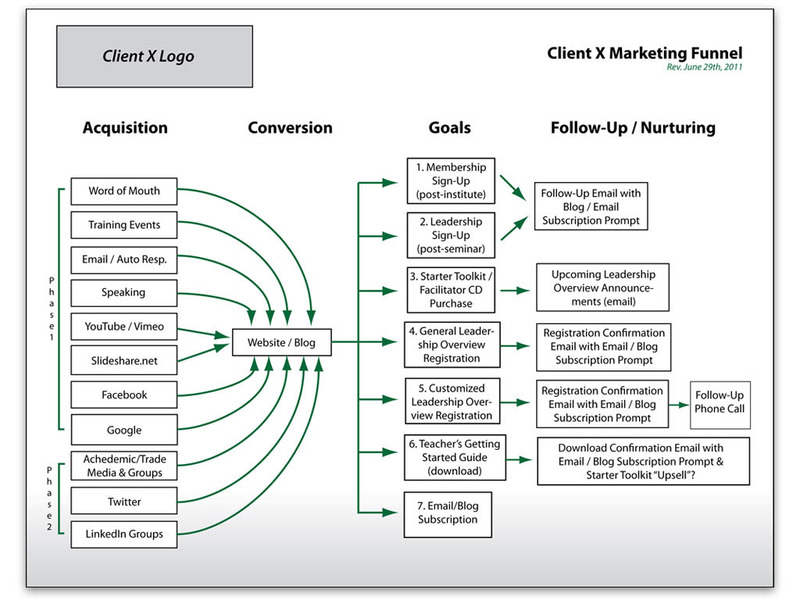 The next step is to map these goals to linear conversion paths within your website’s content. 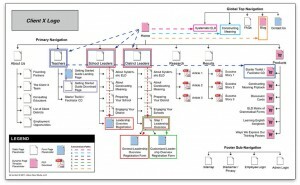 I’m sure most of you reading this are familiar with the concept of developing a detailed sitemap as part of a website development effort. Taking this process one step further, you should literally map out the flow of your conversion paths directly on top of the sitemap. This can be accomplished several different ways graphically, but below is an example that correlates to the previous funnel diagram. As you can see in the legend, I’ve taken the numbered conversion goals from the funnel and created a color-coded overlay that sits on top of the website content architecture. With each conversion path spelled out, the UX and content folks are able to get a clear picture of the paths you want site visitors to follow. Again, these paths are based on both the key tasks that your visitors will want to complete and the task you want them to complete while on your site. Now it’s up to the designers and writers to develop great page content and calls to action to keep your visitors moving through those paths as you intended. If you do all this correctly, visitors are going to convert. What is your process for converting buyer needs to website content? 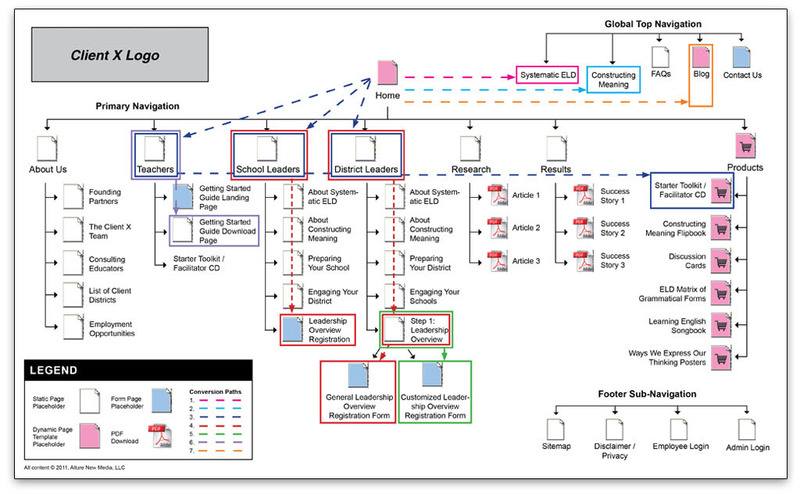 Are you mapping your conversion paths? Did this explanation help? Tell us in the comments!